You’ve just about decided on a course, and you’re relieved that the big, life-changing decisions are over. Think again – they’ve only just begun. If you’ve had a look at the league tables, you’ll notice that each university will specialise in different subjects. 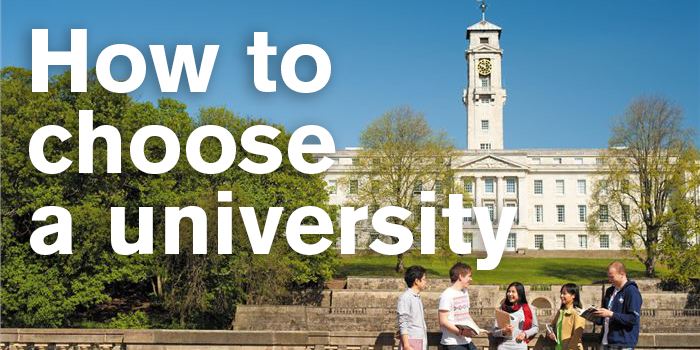 Make sure that the course you’ve chosen is a good choice for your university. For example, Russell Group universities are great for academic and traditional disciplines, whereas former polytechnic universities are excellent choices for vocational degrees. For many people, the student lifestyle is the best part of going to university. So, it’s important to research how affordable the city you’re studying in is, and what that city has to offer. For example, if you’re looking for great nightlife, a huge variety of societies and sports teams, and a growing arts and music scene, Nottingham is an excellent choice. The city offers everything from shopping, to clubbing, to art classes and gigs. However, you may prefer a University located in a more serene, countryside area, in which case perhaps a university like Exeter could be the one for you. The Campus or the City? The way in which different universities are mapped out might sound like a negligible aspect of university life, however, it actually has a huge impact on the student experience. Some people may prefer to be on a campus, like Nottingham, where you’re in your own private student bubble, with all necessities located within 15 minutes (or 20 minutes on a bus into town). On the other hand, you may like to be in a university that’s placed within the lively city center, like Nottingham Trent, where you’re among real Nottingham life and in a walking distance from restaurants and clubs. Equally, it’s important to think about how accommodation impacts this decision. At Nottingham, all first year accommodation is placed within the campuses, so you’re in walking distance from your friends in other halls and your lectures. There is a variety of self-catered and catered accommodations to choose from, so make sure you explore these choices and see if the university you’ve chosen offers the right option to you. Once you’ve considered all of these factors, compile a shortlist of your favourite universities and book yourself on to some open days! You’ll find that you can only really get a feel for a university when you see it in the flesh, and can truly imagine yourself studying there. This will give you the chance to ask important questions about your course, have a tour around the campus and accommodations, and go for a walk around the city. If you’ve completed all these steps, you are now fully equipped to pick the best university out there for you, and can go on to daydream about your future life as a student. Enjoy!